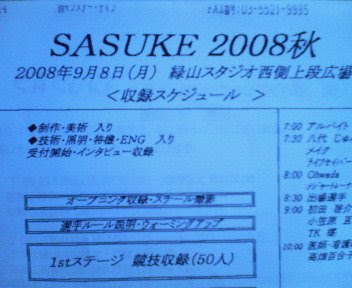 While we wait for the actual airing of Sasuke 21 on TBS everyone and their mother check blogs and other sites for updates, spoilers (unlikely) and pics galore to wet our appetite for Wednesday, September 17, 2008! TBS has finally put up their Sasuke 21 page on their website! 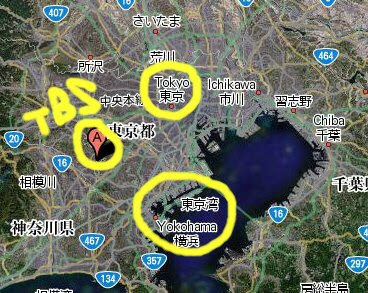 It is the hero and Olympic gold medalist, while Japan's hope for a national flag fighters, or fishermen or firefighter? Beijing Olympics to lose a heated battle is here…. 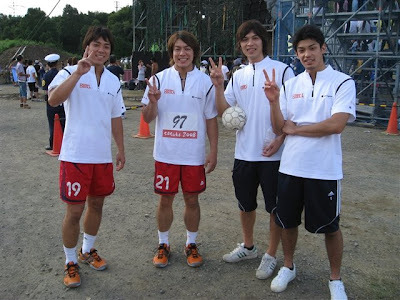 Olympic men departed the name of the ultimate survival of the attack, SASUKE,. The men will take the stage to fight again. 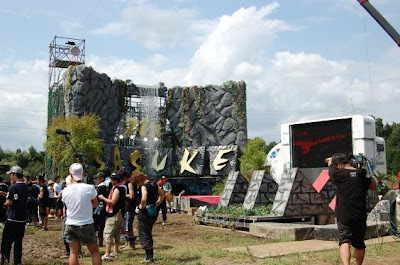 1997 SASUKE the attack began, the ultimate survival of this fall in the 21 th anniversary. The Memorial Tournament 20 times last year, from 100 FASUTOSUTEJIKURIA three and a third-round stage for only one of 100 people and challengers before a virulent. Also, the final tournament before the U.S. qualifying competition to get through the top U.S. Representative Lee MYUENBAGU Vai. SASUKE, home of the lost prestige of Japanese. (No pressure on the Japanese this time.. right? LMAO) This is really…. SASUKE Currently, the world's most exciting. This is also a national qualifying tournament is through the strongest line-up. And the Beijing Olympic medalists are going to war. Exactly what the world stage is now set to determine the champion. Steel Magic Castle will dominate the world or the name of TOPPUASURITO Athlete of the departed? Wow.. okay! That was interesting. Sad to not see Akiyama listed (cry..... I wanted him back..) ECSTATIC that Bunpei is back!!! Hysterical that they are now making this the tournament where Japan gets it's prestige back LOL. What a way to drum up hype for this! Okay.. now to catch up on the last 2 days of whirlwind blogs..
September 13 (Saturday) for the Ryukyu Corazon warfare training. He's been training (at the very least since August) for Sasuke 21. The first set of pictures from Sasuke 21 actually came from his site again. The one above and the 2 below. This one had me thinking for a bit because Naoki's blog only showed Muscle Musical things and not Sasuke (though that's usually normal from him anyway.. he rarely posts anything on Sasuke). It wasn't until TBS posted their lineup for the 17th that they finally put to rest the rumor that he was not going. He IS going and here's proof in a picture. Poor Masaki-san.. he's already getting treatment.. I assume before his run? Funny how there is a tent for this stuff.. I'm sure they are working that aaaaaaaaaall day long! LOL. 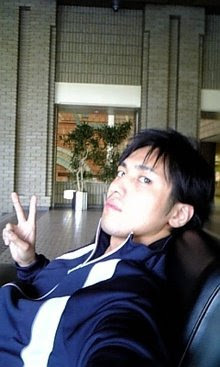 Takahashi Mitsuomi - he's Satoru Akashi or Bouken Red from Super Sentai (or Power Rangers to me :p ) put an entry on his blog today as well about Sasuke! I watched a G4 special she hosted on Kunoichi and she totally BUTCHERED the names of nearly every all-star. I ask you, what business does she have COMPETING?? But no joke, that Munn chick had better not lay one finger on my all-stars. I will dangle her from Mt. Midoriyama by her hair. Then again.. there are commedians there that show up for business opportunities and nothing else :p But at least they KNOW the show.. LOL Oh well.. My frustration with the whole thing is that I'll see more of her than the actual competitors of the show that actually train for this.. which makes me dread November like the plague..
At least we have next week :D /passes popcorn..
LOL all the people on the show are not on Sasuke :p And besides.. if she speaks fluent Japanese she sure fooled me.. she hasn't actually pronounced any of the regular contestants name right. At all.. I'd say her history in Japan is irrelevent. My beef is that she displayed no knowledge of the show she is going to be on when most likely hundereds of die hard fans were denied an opportunity to compete. Okay, I wrote a whole great sarcastic comment and blogger ate it. So I won't try to re-do it. Will just say, "Lovely post Elsie dear." Wow!!!! You people really need to let up on Olivia Munn. You act like she desecrated someones grave. She went on a japanese tv show where people run around on a obstacle course and fall into muddy water. It's not the Olympics. She was having fun trying something a lot of female american celebrities wouldn't even think about. So she's not a reguler contestant or trained for 50 yrs to bet the course that doesn't give you the right to stick your nose up at her for trying. Judging from those screen caps there were a few women from japan that weren't so hot either and your not giving them a hard time. The sad thing is that the people at Sasuke where more kind and open to her running the course then anyone I've seen post on this blog. That is so true, Elsie. As you know I cannot stand Olivia Munn, but you are correct, she did something that a lot of other celebrity females would not do. More power to her. I just wish she'd quit being so gross. :) I find it difficult to look at her.